A key determinant of the growth of wealth for Americans over the next decade is likely to be the federal debt. On January 28th, the non-partisan Congressional Budget Office released its annual 10-year forecast of the debt. Here's what the CBO said along with five observations adding context to understand this risk to U.S. investors. 1. 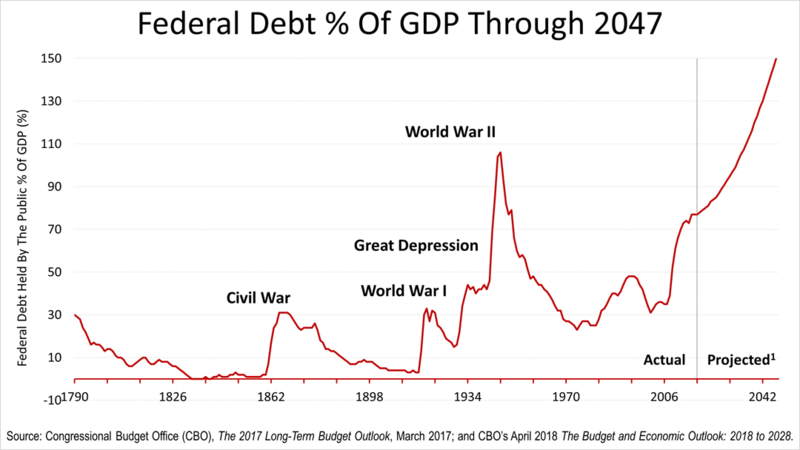 This frightening long-term projection by the CBO is very unlikely to be the course of the federal debt in the future. We're at the beginning of the explosion in the federal debt and it becomes unsustainable in the years just ahead. 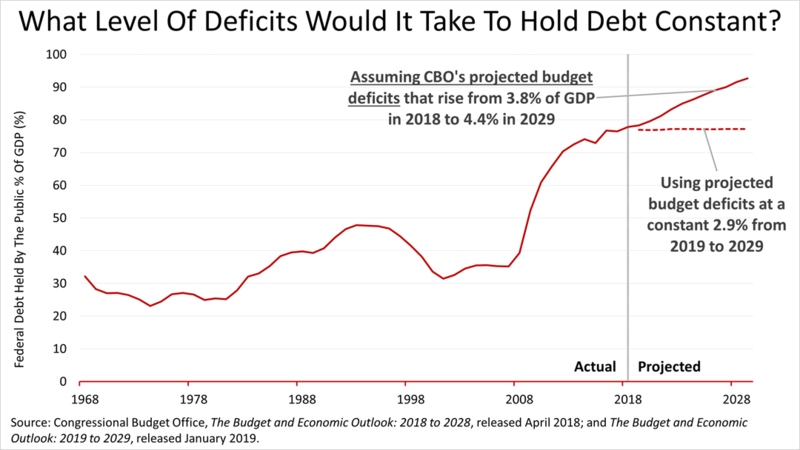 The long-term debt accelerates annually because of federal deficits in this CBO projection of a budget deficit in 2018 of 3.8% rising to 4.4% annually in 2029, resulting in the stratospherically-soaring forecast through 2047. This scary picture assumes nothing is going to be done about it in the years just ahead. 2. The debt problem is not so hard to solve if you look at the math. The scary soaring debt is not inevitable; it's not even hard to avoid! Independent economist Fritz Meyer, whose research we license to share with you, says the optimal annual federal spending deficit is 2.9%, which is not so much lower than the scary soaring projection rising from 3.8% in 2018 to 4.4% in 2029. To be clear, any combination of spending cuts or tax hikes that lowers the annual budget deficit to 2.9% of gross domestic product annually for the long run solves the problem of funding Medicare, Medicaid and Social Security. Budget deficits equal to 2.9% of GDP would result in no increase in debt as a percentage of GDP. 3. Balancing the budget would be a bad idea. While a popular political slogan, a policy of balancing the federal budget annually would be ill-advised. The government has an infinite lifespan, unlike people. The federal debt is not like your family balance sheet. Optimizing the infinite lifespan and unique credit status of the U.S. by leveraging these assets is rationally appropriate. Running an annual deficit is wise, as long as debt payments do not overcome America's ability to pay it off. A prudent amount of debt is the optimal goal. 4. 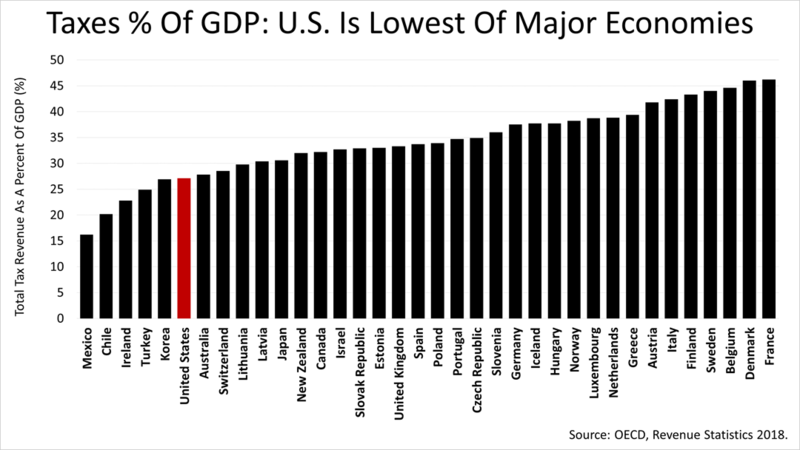 The U.S. is a low-tax nation. According to the Organization of Economic Development, the U.S. once again this year was among the lowest-taxed nations in the world. The U.S. has one of the lowest total tax burdens among the 34 OECD countries. The economies with lower tax burdens than the U.S. are tiny in size by comparison. The U.S. is in a class by itself because it is much larger and growing fast, yet its tax rate is relatively very low. 5. The long-term debt of the U.S. is not a financial problem, but a political one. Compared to Germany and France, U.S. tax revenue as a percentage of gross domestic product was much lower. 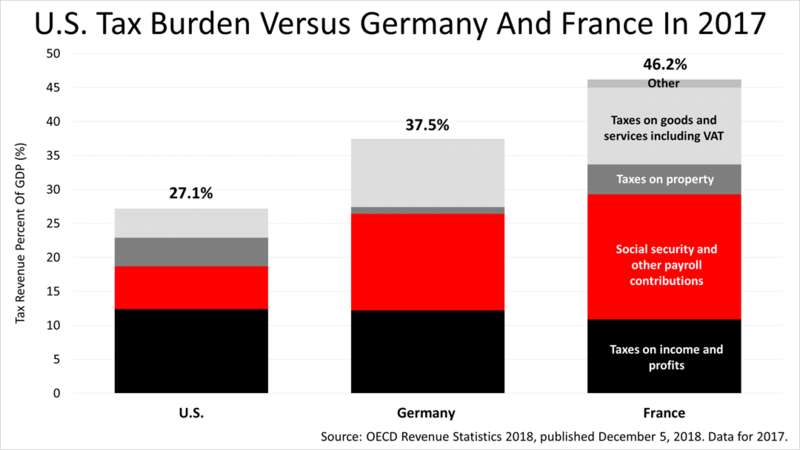 With much stronger growth prospects than Germany or France, slightly increasing tax revenue in the U.S. would not materially change this picture, underscoring that solving the long-term federal debt issue is not a financial problem, but rather a political one. 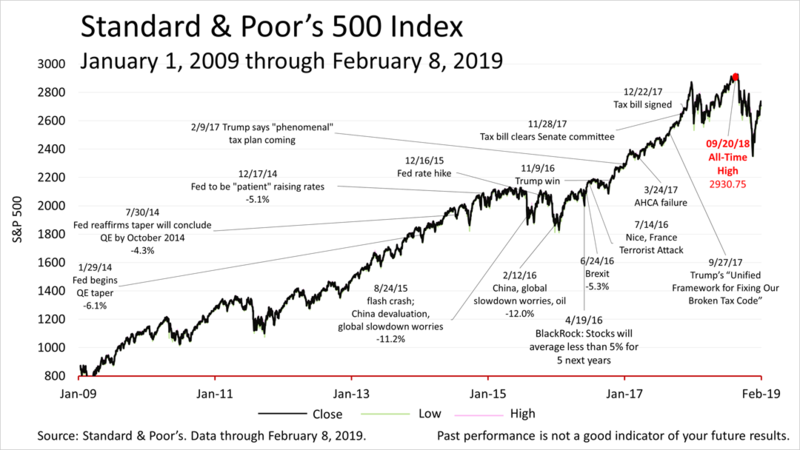 Despite the long-term U.S. Government debt, a looming trade war with China, and many other problems, the Standard & Poor's 500 stock market closed on Friday at 2,707.88 — just 7.6% below its all-time closing high on September 20th, 2018. The S&P 500 index, a key growth component in a broadly diversified portfolio, closed last Friday at 2,706.53, up from 2664.76 a week earlier. The market suffered a 19.8% plunge from September 20th's all-time closing high to the Christmas Eve closing low of 2,351.10, and then it rebounded. 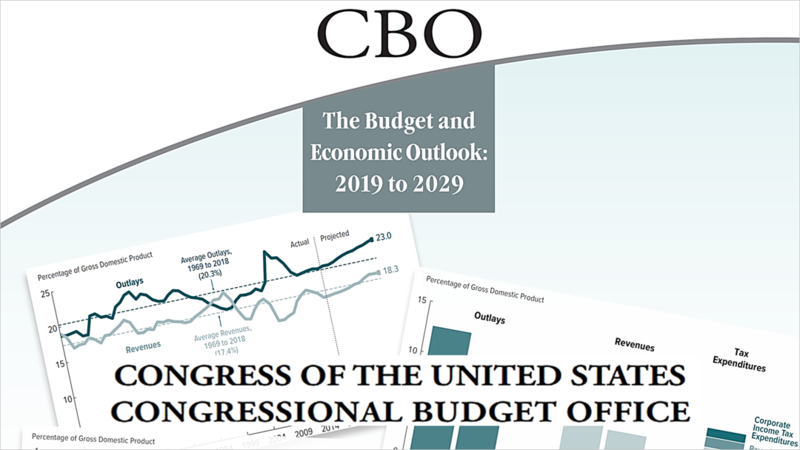 1CBO's 10-year and extended baselines generally reflect current law and are meant to serve as benchmarks for measuring the budgetary effects of proposed changes in federal revenues or spending. They are not meant to be predictions of future budgetary outcomes; rather, they represent CBO's best assessment of how the economy and other factors would affect revenues and spending if current law generally remained unchanged. OECD, Revenue Statistics 2018. 2017 data for all countries except 2016 data for Australia and Japan. Includes data for the 36 OECD countries and does not include non-OECD countries such as China, Brazil, India and Russia. Includes all forms of taxes: federal, state and local; income taxes, sales taxes, VAT taxes, estate taxes, property taxes, etc.